De Loutherbourg was born in Strasbourg, but moved with his family to Paris in 1755. He exhibited at the Paris salon from 1762. His works were mainly either landscapes inspired by Dutch 17th-century prototypes or romanticised shipwrecks which continue the tradition of Claude-Joseph Vernet (1714-1789). He also painted pictures of bandits recalling the style of Salvator Rosa. He moved to London in November 1771 where he worked as a stage designer at the Drury Lane theatre for David Garrick and subsequently for Richard Brinsley Sheridan. He is recognised as the most inventive and influential stage designer active Europe during the eighteenth century. He continued to paint landscapes in England, his work tending to become more topographical. 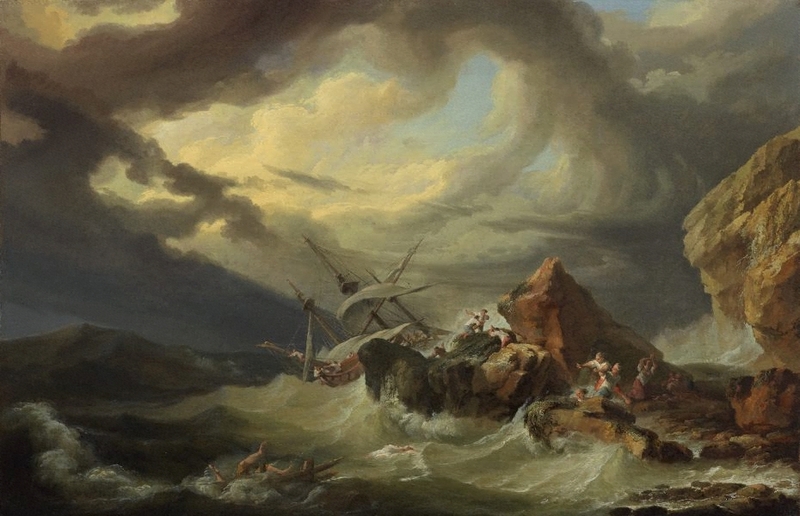 He subsequently turned to Biblical subjects where his sense of the dramatic find expression in scenes of terrfiying chaos, works which 'made a profound impression on J.M.W. Turner and John Martin'. Signed and dated l.r., brown paint "J P [de]e L fec / 17[5?][?]". Private Collection, Germany, dates unknown. Sold at auction, Van Ham, Cologne, 8 Apr 2000, lot 1537. Agnew's, London, 14 Dec 2000-2002, London/England, Purchased at auction, Sotheby's London, 14 Dec 2000, no 220 (consigned to them from the 'continental trade). Purchased by the AGNSW from Agnew's, 26 Feb 2002. Art Gallery of New South Wales Annual Report 2002 , Sydney, 2002, pp 11, 24, 62, col illus p 12. Richard Beresford, Look , 'Major European work: Art Gallery Society's gift by an artist of genius', Sydney, Jun 2002, p 16, col illus p 16. Richard Beresford', Look: 1953-2003 celebrating 50 years , 'Transformation: Society's gifts of enriching art from Europe help collection turnaround', Sydney, May 2003, pp 45–47: p 47. Terry Ingram, The Australian Financial Review , ‘A masterly deal. Shipwreck finds a home’, 17 Jul 2002, p 52, illus p 51. Olivier Lefeuvre, Philippe-Jacques de Loutherbourg, 1740–1812 , Paris, 2012, p 218, illus p 217, fig 114. Connell Nisbet, Look , Acquisitive minds: two curators reveal the rigours of buying artworls for the Gallery', Sydney, Dec 2003-Jan 2004, pp 23–27: col illus p 25.
art lovers: the story of the Art Gallery Society of New South Wales 1953-2013 , Sydney, 2013, p 285, col illus p 285. 'Acquisitions funded by the Art Gallery Society 1953–2013', pp 192–314. Old master paintings Part II , London, 14 Dec 2000, p 116, no 220, col illus p 116. as 'Follower of Claude-Joseph Vernet'. Alte Kunst , Cologne, 06 Apr 2000, p 146, no 1537, illus p 146. as ''Schiffbruch an felsiger Küste' by Claude Joseph Vernet''.